Anyone who’s trying to recruit tech talent these days will attest that it’s far from being a walk in the park. And by the looks of it, it’s not going to get any easier soon. The demand for tech talent is projected to further increase a by a significant 12% in the coming year. Now imagine this. You have 2 months to recruit a whole IT team, in a city your company has never recruited before, with practically zero employer brand awareness and a non-existent network within the IT community there. Sounds like a mission impossible case, doesn’t it? Most TA professionals would resort to working with agencies when facing a similar challenge. Not Scott Johnson, VP Talent Discovery at Redington, though. He decided to try a different approach when his CTO, Adam Jones, tasked him with recruiting five software developers, including a team lead for their new office in Bristol. Instead of relying on agencies, grinding through CV databases, racking up cold outreaches to candidates, or blindly posting jobs ads, he decided to organise a tech meetup in Bristol and promote the event online. 1,4 million online impressions, 5862 video views, 4930 clicks, 95 event registrations, 55 attendees, 20 candidates added to the pipeline, 15 candidates, interviewed, 5 hires including a lead developer, £ 20.0000 saved compared to using agencies, and invaluable employer brand exposure for Redington within the Bristol tech community. Want to see how Scott did it? Watch this video (3m47sec) and read on for more in-depth details. ‘We needed to change this narrative by being more creative, so we did some work on energising our brand and telling our story.’, explains Kav Patel, Head of People. They came up with the idea to organise a meetup, where they could showcase their company share their purpose of making a 100 million people financially secure in a way that’s native for the Bristol tech community. Mind you, the meetup wasn’t positioned as a career event and jobs weren’t promoted at all. Redington’s CTO introducing the company and announcing their move to Bristol was only as a fraction of the overall program, but the main focus was on topics relevant to the tech community (Serverless Development in AWS Lambda and avoiding the curse of fragile development), along with networking. Check out this after movie for an impression of the event itself. ‘The event was a great success! Fifty five people showed up -about a third and a third and a third from the IT, Tech community and Social Enterprise, who were really interested in what Redington does and also made some useful connections within that community. So we positioned this as a meet up, and ultimately it gave us an engaged community from which to hire from in the future’, Adam Jones – CTO at Redington. 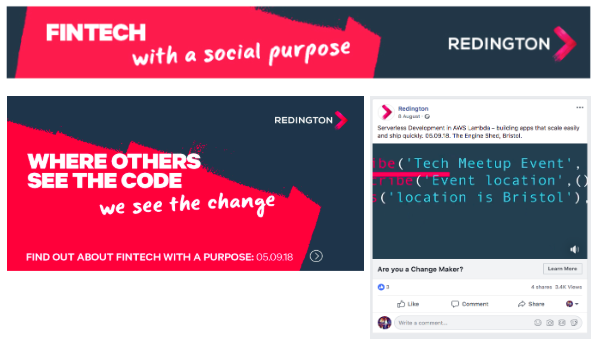 ‘To fulfill our objectives we’ve created a series of messages….Then we went on delivering these messages through sharing them via various channels using strong imagery, great copy and some really strong engaging video’, explains Nick Martin – Head of Creative at Redington. They then made sure this content reached their desired tech audience, by distributing it in a highly targeted manner, via the most relevant channels. In this case those were: Social media (YouTube, Facebook, LinkedIn, Instagram and Twitter), online communities (Reddit and StackOverflow), and ad networks (Google Display and Google Search). Everyone who registered for the event was contacted by Scott right away. Again, initially no conversations about Redington’s job opportunities took place. Rather than that, Scott thanked people for registering and asked them what motivated them to do so. This led to meaningful conversations, some of which naturally led to employment-related topics. As a result, Scott had several candidates in process and had acquired a ton of relevant information about the Bristol tech community, is before the meetup even took place! Shortly after the event Scott managed to fill all five of his tech vacancies, and on top of that he built a strong candidate pipeline. Want to find out how you can activate your employer brand and connect with your key candidate target audiences? Our specialist are happy and available to support you if needed!